Have you ever decided to get down on your knees with the kids and crawl around for even a minute? Holy HECK people, that stuff hurts! No wonder the kids want to start walking as soon as possible. My current sweet baby has just decided that crawling hurts too much (we have tile floors, so....OUCH!) and is attempting to walk like the rest of human kind on just the two feet. I started to wonder if she would ever do it. All my other children were walking before a year and this one...well, she didn't even seem interested. Not much cruising going on. Not much interest. She was a happy crawler. Fast and cute as a button. She even took to wearing flip-flops on her hands as she made her four legged way around the house. How hilarious is that?! Then, suddenly and the day before she turned 13 months she decided it was time. She walked. Across the room. She was ready! Now of course she prefers to walk. It is a little more comfortable and certainly hurts less on the concrete patio. No more dirty knees and being below the big kids. She has joined the ranks of toddlers. I have decided that humans tend to be perpetually dissatisfied with life. The downside of this is that lots of us spend too much time complaining. The upside though is that we strive- we want MORE from life. The dissatisfaction helps us push ourselves to be better and faster and happier. We have this desire even as babies. We want to find an easier way and be a little more like those around us. I have had people complain sometimes about this little blog for various reasons. (Too many to get into or even care about.) But sometimes that complaint is that I use the word "pain" when it comes to birth on occasion. I think it is absolutely FABULOUS if a woman takes the right birth class and has a painless birth. It is also shockingly wonderful if a woman is happy as a clam and feels like a million bucks at the end of her pregnancy. It happens, I have even kind of been there. I no longer believe that life is supposed to be easy and breezy all the day long. It requires work and sacrifice and yes, sometimes pain in order to be better, do more, and find out what we are capable of. A healthy infant will eventually want to get off the floor. They will push themselves. They will stand and find a better way of getting around. Some will do it earlier. Some later. Some will even need some encouragement. But they get there. They decide they are ready for something different. 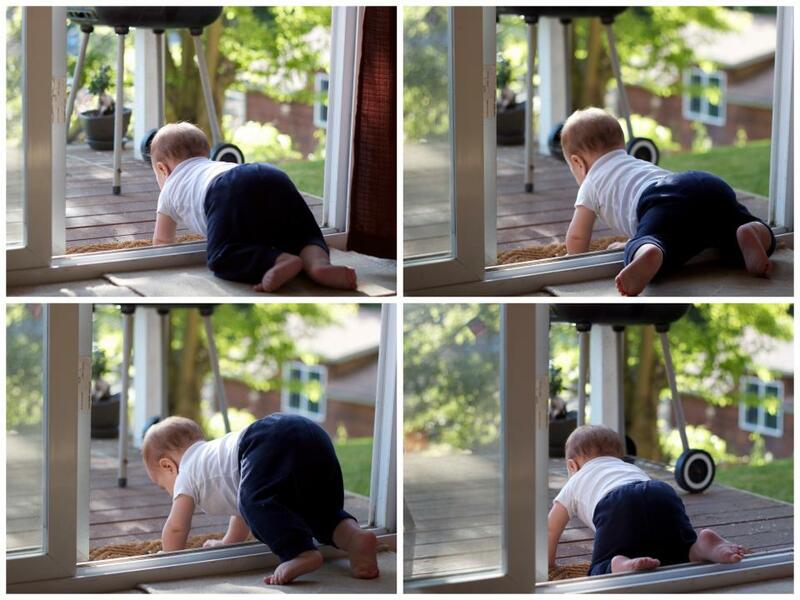 This baby is ready to escape! A pregnant woman will eventually go into labor. As I get older and more jaded (and have experienced four blessed pregnancies) I believe that that PAIN at the end of pregnancy serves a purpose. For me, it makes me WILLING to go through the work of labor. It makes me open to the idea of another birth. 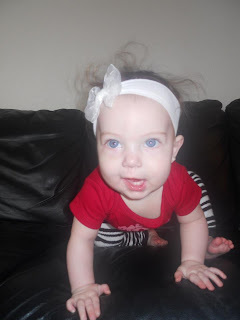 When I found out I was pregnant with my fourth baby I was petrified. This is kind of embarrassing to admit on my natural birth blog- but I was scared of giving birth again. I had just done it about a year before and I remembered the intensity. I remembered recovery and sleepless nights and all the stuff we aren't supposed to talk about. By the end of my pregnancy though, I was ready to give birth! BRING IT! Oh yeah, pregnancy makes you willing to push a nine pound baby out of your crotch. That's just the truth ladies. So maybe the end of pregnancy "hurts". It is almost definitely uncomfortable and there is pretty much no way it feels as good as not being pregnant. But just like the intensity of labor (that makes you want to push out the baby) and just like the hard cement on baby knees, the pain of pregnancy serves a purpose. It prepares us for accepting the next road, a road we may have been afraid of or resistant to experiencing. It gives us motivation to birth. Like a baby crawling they all have their own mind. A baby is not just a passenger, they are already involved in the process. They want to be part of the decision making. 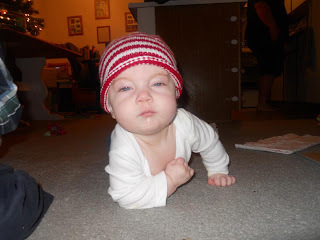 You can't force a baby to walk and you can't force them to come when convenient. They choose their own timing and it doesn't always jive with ours. To me that is the biggest lesson of pregnancy, and much more important than the aching back and joints and swollen feet. The lesson of pregnancy is that we no longer are totally in control of our lives. Another human being is both dependent and needy of us and our time and our will. Sometimes we have to accept what is best for them and allow our own comfort to take a back seat. THAT is why I love birth- it is a teacher and in the most poetic and subtle ways. Pregnancy and birth do not exist to cause us pain, they exist to teach us how to be mothers. Motherhood is not always a painless road but it is one you want to travel. It has the best scenery. Take a moment to look around. You just might enjoy it. It's funny you say that. People keep asking me how it's going in my last few weeks now, and all I can say is, "Jut playing the waiting game." it's not that pregnancy has been really unpleasant for me, I really enjoyed it. But in this last stretch, I do get impatient. I always compare it to my skydiving experience...it had been raining that morning, and the clouds had delayed my jump by about three hot, humid, boring hours. By the time I was up in that plane, I was SO ready to jump. Should be any day now, and I'm pumped! My first pregnancy I wasn't that uncomfortable. I had no kids, I was focused on grad school (graduated 3 weeks before due date) and really could take it easy. The second pregnancy I don't remember being that uncomfortable at the the end either. My first "baby" was extremely difficult as a baby, but was wonderful, easy and biddable as a toddler. And I had something to prove. I was going for a HBAC and my husband was home from work a lot. I know I got a little uncomfortable, but no big deal. This last time (I have a 2 week old looking at his sisters with big blue eyes) I was petrified. Don't ask me why, but I had a lot of fear about this birth. I did not want to give birth. I still wanted to do it at home, but I had a lot of anxiety and fear. And by the end of this pregnancy I was sooooo extremely uncomfortable and in so much back pain that I was about to ask for any kind of narcotics I could get! That pain pushed me from terrified of this birth to being more miserable being pregnant than scared of the birth. Those last few days I was sooooo done I was willing to go through anything to have this baby! It seems God, in his graciousness, gave me what I needed to go from fear to acceptance. And it's possible I'm actually getting more sleep waking multiple times with a newborn than those last weeks of preg. If not more sleep, than more energy from the lack of pain (after pains are gone!) and getting some sleep! Great post :) I find the whole 'birth isn't painful' shtick to be minimizing and a little bit anti woman. I remember in one of my birth classes the instructor saying "it's not pain, it's pressure" and during my labour turing to my husband and saying "it's not pressure. It's f*cking pain!". I think birth advocates think they are doing the right thing with the existentialist "there is no reality, only perception" stuff but it denies the experience of most women when giving birh. The experince of giving birth for me was powerful, it was beautiful but it was painful. I'm really not sure what purpose is served by denying the realities of birth, of attempting to strip it of any negativity at all. In my experience anything good comes at a price and I'm comfortable that in order for my body to do that amazing thing and to deliver me that amazing gift it needed to go through pain. I keep thinking the same thing about teething and labor. My baby is teething, and the pain drives him to rub his gums, which in turn helps the teeth to come out. Everyone keeps telling me to give him Tylenol (I give him homeopathic teething tablets), but I don't think it's necessary to subject him to chemicals, artificial dyes, and medicines that could potentially harm his organs, because if teething hurts it's because Nature MEANT it to hurt for a reason! The same applies to labor: if it hurts it's because that pain makes the woman want to move, shift, work to get that baby out efficiently and effectively. When you numb that pain with an epidural, you remove the signals from the brain to the rest of the body that would help the baby to descend and would help the mom to push him out. I'm hoping to conceive again in six months, but part of me is still shell-shocked by the pain of the last few weeks of pregnancy (back in January) and the intensity of the 12-hour home labor that ended with a beautiful 10-lb. baby. 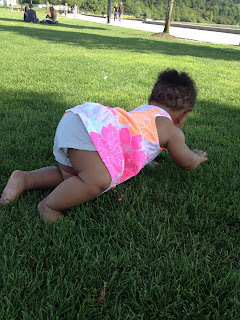 I love the whole crawling thing especially because my baby turned 15 months today and she is still not walking. She was a preemie, but I just worry that she's not walking yet. So knowing that other babies are taking their time makes things seem better.